This bed is very well built, fabric upholstered is soft and beautiful, color is very neutral grey. It came in 3 separate packages and was very easy to put together. Love my new bed ! Dimensions 82.3 In. X 65.4 In. X 67.0 In. Perfect bed! 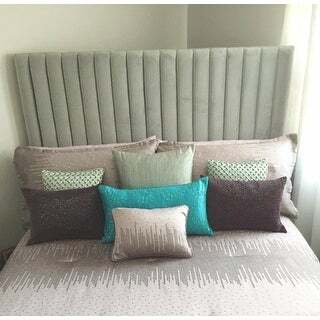 After searching for more than a year for a specific fabric, color, and headboard height, I found it in the Arabelle Grey bed. It's sumptuous, luxurious, and yet practical. 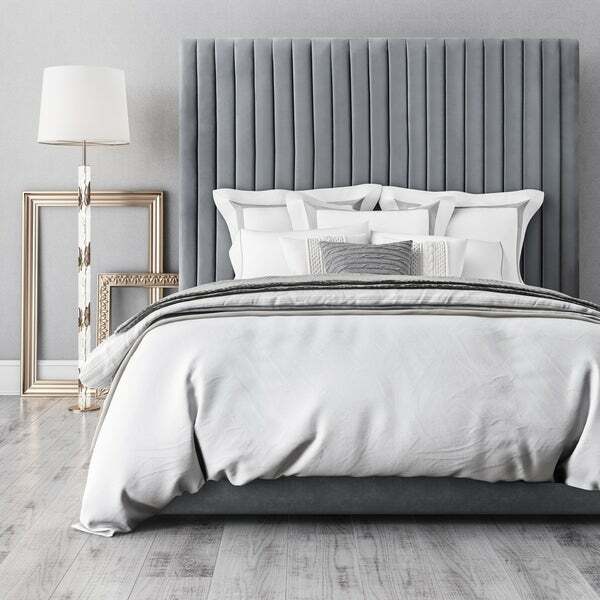 The grey velvet is absolutely gorgeous, the platform style allows use of box spring or not, depending on your preference. I bought the queen size, and did use a full size box spring, so the headboard may not look as tall in my photo. Arrived ahead of schedule, very well packaged, and in perfect condition. Assembly is a no-brainer, and doesn't take more than half an hour, once unboxed. Love this bed! Amazing bed, good to assemble. Would recommend to anyone. Very nice design and texture, modern and clean. High headboard makes the room dramatic. Ceiling is 10 ft, so I needed high headboard and this one is the winner! Easy to assemble. "What is the best height for mattress and box spring for this bed?" This bed comes with slats, so it does not require a box spring. However, if you prefer a box spring you donthave to use the slats. The headboard is quite tall, so an average height mattress would be reccomended. "Description says this is a king bed, but in the drop down only queen is available." Their coding is wrong. I had to call Overstock to get a King. Well...still waiting for it.